Considered one of the most food-friendly and approachable wines on the planet, Merlot surged to popularity in the United States in the 1990s. Now wine-lovers can find great Merlot and delicious Merlot blends from all over the world – from South America to France to Italy to right here in Temecula Valley, California. 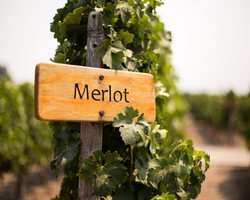 Here are five fun facts about Merlot! 1) Did you know the word “merlot” translates to “young blackbird” in French? The name was thought to have been given either because of the grape’s beautiful blue-black color, or blackbird’s fondness for grapes. 2) Merlot’s flavor profile fluctuates within the sweetness spectrum. Cooler climates bring out hints of berries, plum, and even tobacco. Merlot grown in hotter climates might mimic flavors found in fruitcake or chocolate. 3) A bit about Merlot blends: When Merlot first arrived in California, it mostly sold as single varietal bottlings (100% Merlot) until winemakers began blending it with other red grapes in the French Bordeaux tradition. Now, California’s Meritage wines are a signature of the state and always include Merlot as one of the essential blending grapes. 4) Merlot is so popular because of the grape’s ability to please all palates. Wines can range from very fruity simple wines to more serious, barrel-aged bottles. 5) Merlot has a high sugar content and low acidity, which makes it a very food-friendly wine, able to be paired with a variety of dishes. For example, Cabernet-like Merlots pair well with grilled meats. Softer, fruitier Merlots go well with salmon, mushroom-based dishes and greens. Light-bodied Merlots pair well with shellfish like prawns or scallops, especially if wrapped in bacon or prosciutto.